Normally cart abandonment happens in a WooCommerce Shop due to various reasons such as internet connectivity issue, unexpected extra charges, Website Errors/Crashes etc. The best way to Recover Abandoned Carts is by sending an email and offering coupon which encourages customers to complete the order and helps to increase the sales. In this article, we have listed 3 Best WooCommerce Recover Abandoned Cart Plugins. 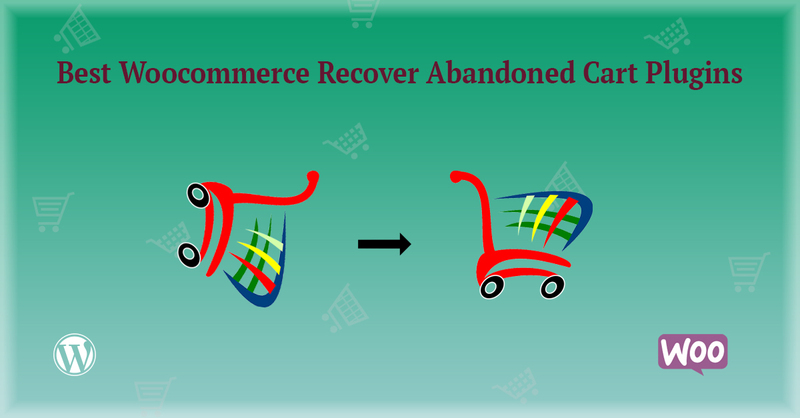 WooCommerce Recover Abandoned Cart is a WooCommerce extension developed by FantasticPlugins. Using this plugin, you can monitor the carts which are abandoned by the Members as well as Guest Users and send a follow-up email notification to them which includes the cart link to recover the abandoned carts. If the buyer didn’t respond, you can encourage your users by sending a coupon in an abandoned cart email. i) Registered Users – Cart will be captured once they add the product(s) to cart. ii) Guest Users – Cart will be captured once they entered their valid email id at checkout form. YITH WooCommerce Recover Abandoned Cart is a premium plugin developed by yith. It allows you to send the email notification to the user with their abandoned cart link and you can send an automatic email in the user’s related language. Also, you can send coupons or customized email to your customers to encourage them to complete their recovered cart purchase process. Abandoned Cart Lite for WooCommerce is a free WordPress plugin. It allows you to send the email notification to the guest user as well as the registered user who have added your products to their cart but didn’t complete the order. You can set automatic and well-timed email notification to remind the user about their abandoned cart.